In January I attended the 10th annual Southern California Linux Expo. In addition to speaking and running the Ubuntu booth, I had an opportunity to talk to other sysadmins about everything from selection of distribution to the latest in configuration management tools and virtualization technology. I ended up in a conversation with a fellow sysadmin who was using a proprietary virtualization technology on Red Hat Enterprise Linux. Not only did he have surprising misconceptions about the FOSS (Free and Open Source Software) virtualization tools available, he assumed that some of the features he was paying extra for (or not, as the case may be) wouldn’t be in the FOSS versions of the software available. Regardless of what you use for storage (a single hard drive, a RAID array, or an iSCSI device), the open source DRBD (Distributed Replicated Block Device) offers quick replication over a network backplane and verification tools you can run at regular intervals to ensure deta integrity. Looking to the future, the FOSS distributed object store and file system Ceph is showing great promise for more extensive data replication. Whether you’re using KVM Kernel-based Virtual Machine or Xen, automatic failover can be handled via a couple of closely integrated FOSS tools, Pacemaker and Corosync. At the core, Pacemaker handles core configuration of the resources themselves and Corosync handles quorum and “aliveness” checks of the hosts and resources and logic to manage moving Virtual Machines. While development of graphical interfaces for administration is an active area, many of the basic tasks (and increasingly, more complicated ones) can be made available through the Virtual Machine Manager application. This manager uses the libvirt toolkit, which can also be used to build custom interfaces for management. In virtualized environments it’s common to reboot a virtual machine to move it from one host to another, but when shared storage is used it is also possible to do live migrations on KVM and Xen. During these live migrations, the virtual machine retains state as it moves between the physical machines. Since there is no reboot, connections stay intact and sessions and services continue to run with only a short blip of unavailability during the switch over. KVM has the option to take full advantage of hardware resources by over-allocating both RAM (with adequate swap space available) and CPU. Details about over-allocation and key warnings can be found here: Overcommitting with KVM. Data replication with verification for storage, automatic failover, graphical interface for administration, live migrations and over-allocating shared hardware are currently available with the FOSS virtualization tools included in many modern Linux distributions. As with all moves to a more virtualized environment, deployments require diligent testing procedures and configuration but there are many on-line resources available and the friendly folks at LinuxForce to help. As announced in our Cluster Services Built With FOSS post, LinuxForce’s Cluster Services are built exclusively with Free and Open Source Software (FOSS). Here is an expanded outline of the basic architecture of our approach to High-Availability (HA) clustering. 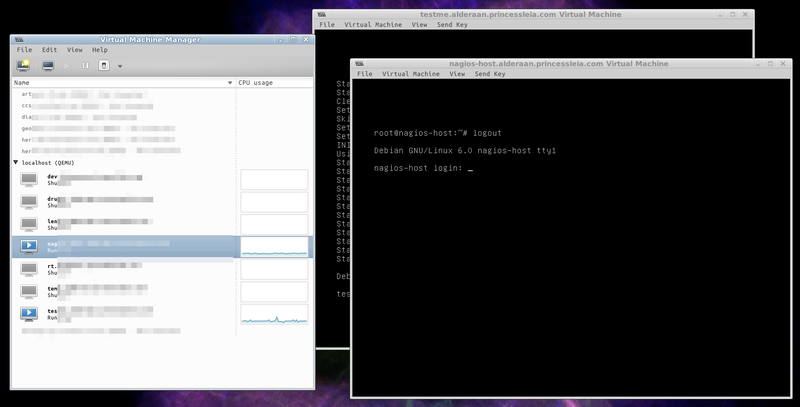 In any HA deployment there are two main components: hosts and guests. 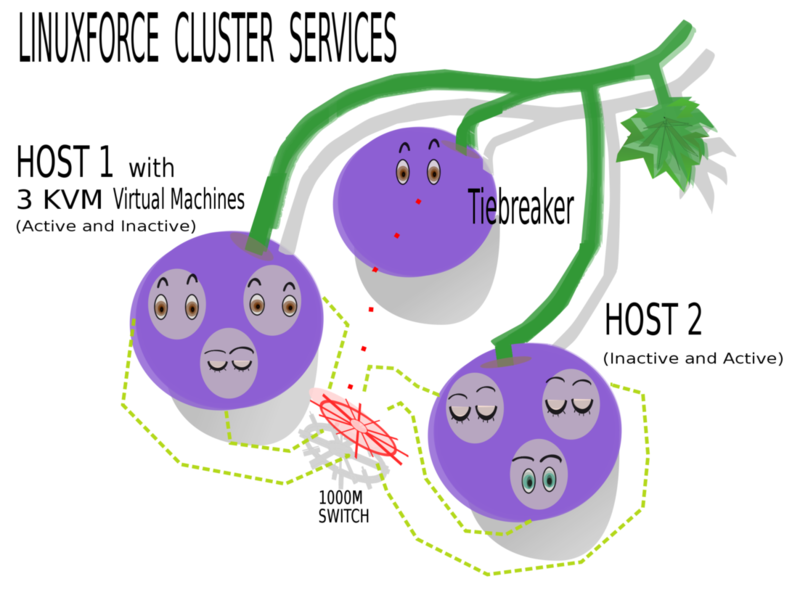 The hosts are the systems which are the core of the cluster itself. The host runs with very limited services dedicated for the use and functioning of the cluster. The host systems handle resource allocation, from persistent storage to RAM to the number of CPUs each guest gets. The host machines give an “outside” look at guest performance and give the opportunity to manipulate them from outside the guest operating system. This offers significant advantages when there are boot or other failures which traditionally would require physical (or at least console) access to debug. The guests in this infrastructure are the virtual machines (VMs) which will be running the public-facing services. On the host, we define a number of “resources” to manage the guest systems. Resources are defined for ping checking the hosts, bringing up shared storage or storage replication (like drbd) as primary on one machine or the other and launching the VMs. In the simplest case, the cluster infrastructure is used for new server deployments, in which case the operating system installs are fresh and the services are new. More likely a migration from an existing infrastructure will be necessary. Migrations from a variety of sources are possible including from physical hardware, other virtualization technologies (like Xen) or different KVM infrastructures which may already use many of the same core features, like shared storage. When a migration is required downtime can be kept to a minimum through several techniques. The first consideration when you begin to build a cluster is the hardware. The basic requirement for a small cluster is 3 servers and a fast dedicated network backplane to connect the servers. The three servers can all be active as hosts, but we typically have a configuration where two machines are the hosts and a third, less powerful arbitrator system is available to make sure there is a way to break ties when there is resource confusion. These systems will be where the guests are run. They should be as similar as possible down to the selection of processor brand and amount of RAM and storage capabilities so that both machines are capable of fully taking over for the other in case of a failure, thus ensuring high availability. The amount of resources required will be heavily dependent upon the services you’re running. When planning we recommend thinking about each guest as a physical machine and how many resources it needs, allowing room for inevitable expansion of services over time. You can over-commit both CPU and RAM on KVM, so you will want to read a best practices guide such as Chapter 6: Overcommitting with KVM. Disk space requirements and configuration will vary greatly depending upon your deployment, including the ability to use shared storage backplanes and replicated RAID arrays, but Linux Software RAID will typically be used for the core operating system install controlling each physical server. Additionally, using a thorough testing process so you know how your services will behave if they run out of resources is critical to any infrastructure change. A third server is required to complete quorum for the cluster. In our configuration this machine doesn’t need to have high specs or a lot of storage space. We typically use at least RAID1 so we have file system redundancy for this host. It’s best to keep these off a shared network, which may be prone to congestion or failure, since fast speeds for both these resources are important for a properly functioning cluster. Like most LinuxForce solutions, we start with a base of Debian stable, currently Debian “Squeeze” 6.0. All of the software mentioned in this article comes from the standard Debian stable repository and is open source and completely free of charge. We use LVM extensively throughout our deployments for the flexibility of easy reallocation of filesystem resources. In a cluster infrastructure it is used to create separate disk images for each guest and then may be used again inside this disk image for partitioning. DRBD is used for replicating storage between the two hosts which have their own storage. Storage needs could also be met by shared storage or other data replication mechanisms. Since hardware-based virtualization is now ubiquitous on modern server hardware we use KVM for our virtualization technology. It allows fully virtualized VMs running their own unmodified kernels to run directly on the hardware without the overhead of a hypervisor or emulation. Pacemaker and Corosync are used together to do the heavy lifting of the cluster management. The two services are deeply intertwined, but at the core Pacemaker handles core configuration of the resources themselves, and Corosync handles quorum and “aliveness” checks of the hosts and resources and determination of where resources should go. We have deployed this infrastructure for mission critical services including DNS, FTP and web server infrastructures serving everything from internal ticketing systems to high-traffic public-facing websites. For a specific example of implementation of this infrastructure, see Laird Hariu’s report File Servers – The Business Case for High Availability where he covers the benefits of HA for file servers. Image in this post by Jeannie Moberly, licensed under CC BY-SA 3.0.